This lean and mean bagger features a lowered rear suspension and a smoked mini-wind screen. 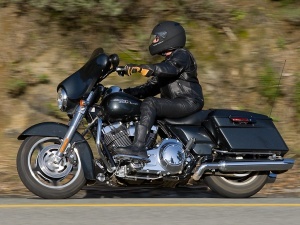 There are attractive styling features on the Street Glide, and the Black Pearl bike I rode looked great. I'm always excited at the opportunity to ride a new motorcycle on a favorite stretch of road. Riding North on Highway One from Big Sur to Carmel is a treat, and it's a great stretch of road for any kind of street bike. 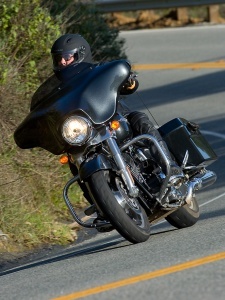 The Street Glide soaked up the miles with ease, making for an enjoyable ride. The "bat wing" fairing with the low wind screen provides just enough wind protection for long days on the road yet gives the rider a taste of the classic "wind in the face" experience. An open-face helmet is more than sufficient, while wearing a full face helmet there was no buffeting and wind noise was minimal. I expected to feel more of the wind effect on steering with the fork mounted fairing, but this was never an issue. I was concerned that the lowered rear end might cause ground clearance problems, but it was never an issue even when riding at a spirited pace. The new black slotted disc cast aluminum wheels are exclusive to the Street Glide, and Dunlop D407 Multi-tread tires provide solid handling and good grip, and steering effort is light and precise. The comfortable saddle, well positioned bars and streamliner floorboards minimize fatigue on long rides. The handlebars and grip position, combined with well-placed and easy to use controls create a natural and comfortable riding position. 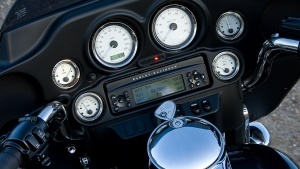 The white gauges are easy to read during day or night riding. The Harmon/Kardon audio system with CD/AM/FM/WB/MP3 capability pumps out the tunes and is clear and loud enough to enjoy at high speeds. Audio controls are easy to locate and operate while riding. The tires have excellent grip and ground clearance was not an issue riding at a very spirited pace over Highway 17 which is known for its tricky downhill turns. 4-piston Brembo calipers, 300mm rotors (dual front and single rear) are very effective at controlling speed, and the front and rear brakes are easy to control. I was completely at ease with the balanced handling and strong brakes. Ground clearance was never an issue on Highway 1 and 17 even when riding at a "spirited touring" pace. I would not have ridden faster on these scenic routes had I been on a sportbike. The new for 2009 touring chassis and swingarm is a solid platform for this very capable motorcycle. The 2009 Harley-Davidson FLHX Street Glide is more than just a good looking bike—it's a very capable touring bike that can handle twisty roads at a spirited pace. MSRP: Black $18,999, Color $19,449, Custom Colors $19,849. Options included on test bike: ABS ($795) and California Emissions ($200). Photos by Kevin Wing (courtesy of Harley-Davidson). 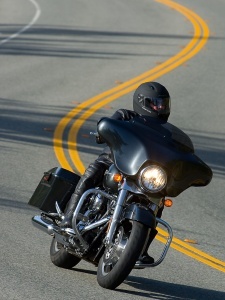 Roadcarvin Magazine Editor Dwight Domonkos took a first ride on the 2009 Harley-Davidson Touring models. Read more about the 2009 Harley-Davidson touring models he rode.